Some alternative solutions to tiles? Today there are plenty. And plenty of reasons to coat them: covering the old tiles can be a convenient choice to give the interior a new look without any restructuring measures. – Adhesive PVC tiles are composed of PVC panels that can be applied to the old tiles with a sticker. Waterproof and perfect for those who look for a DIY solution, they represent a cheap option. – A decorative sticker is another option for those who would like to cover the old, damaged tiles. Some simple stickers of various sizes can be applied to the existing tiles to modify their aspect. The advantages are that they are cheap and easy to apply; it’s important for the stickers to be water and heat-resistant though, for a longer durability and a safety issue. – If the surface is vast but the budget is tight, another option could be to cover the old tiles with a tile varnish: you can apply it with a brush or a paint roller, it dries quickly and it’s waterproof. – For those who want to get rid of joints and to create a uniform surface, resin is a good solution. Ideal for vast areas and to cover tiles, it however needs to be applied by a professional and it can turn yellow over time. 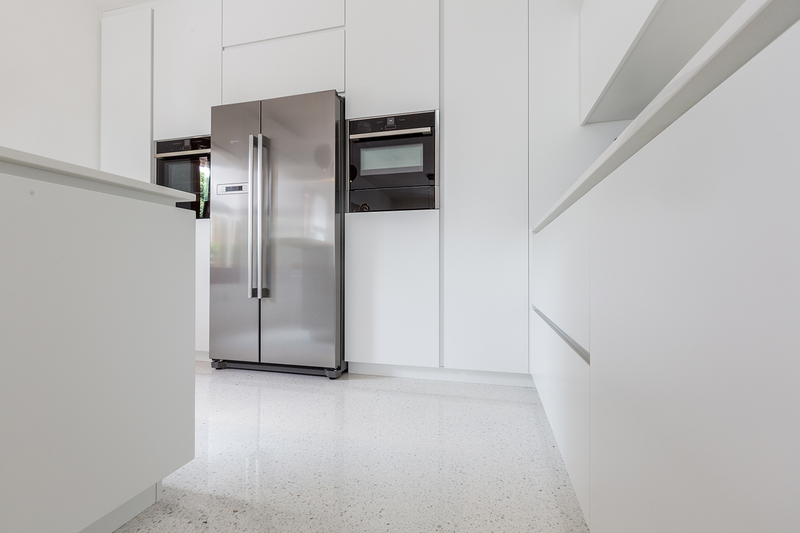 – Last but not least, microcement: a decorative coating for tiling floors but also tiling walls, such as those of the kitchen or the bathroom, and other elements (shower stalls, tubs, sinks, pieces of furniture). Like the resin, it’s a seamless solution and therefore allows to obtain a uniform surface. Compared to the resin though, microcement is less likely to turn yellow and it gives the surface a tactile and natural effect. Ideal Work® is specialized in decorative concrete floors and coatings: with a wide range of indoor and outdoor solutions, Ideal Work® guarantees seamless surfaces suited to cover the old tiles without demolitions. There are endless customization options in both colours and effects; give your house a new look at a convenient price. Ideal Work®’s solutions are suited to cover the old tiles; each one of them has their own features, but all of them are greatly customizable and offer high technical performances. – Microtopping® is a decorative concrete covering composed of a liquid polymer and a specific cement mix which allows the creation of fine seamless surfaces. With only 3 mm thickness, Microtopping® is perfect to quickly change your spaces’s look without demolishing the old surfaces. Its ductility and its great adherence to the substrate allow to apply this product to any material, on both horizontal and vertical surfaces: to cover tiling floors, walls but also for unusual applications such as stairs, tubs, shower stalls, pieces of furniture, fireplaces, countertops, tables and other decor elements. The various combinations of colours and the available decorative inserts, along with the shiny, cloud or acid-stained effects, allow you to customize your surfaces at most and to give them an original look. It’s an ideal solution to create indoor and outdoor concrete surfaces with a tactile and velvety effect. Microtopping® is extremely resistant to wear and weather conditions, it’s easy to clean, quick to install and it guarantees a great performance with floor-heating systems too. 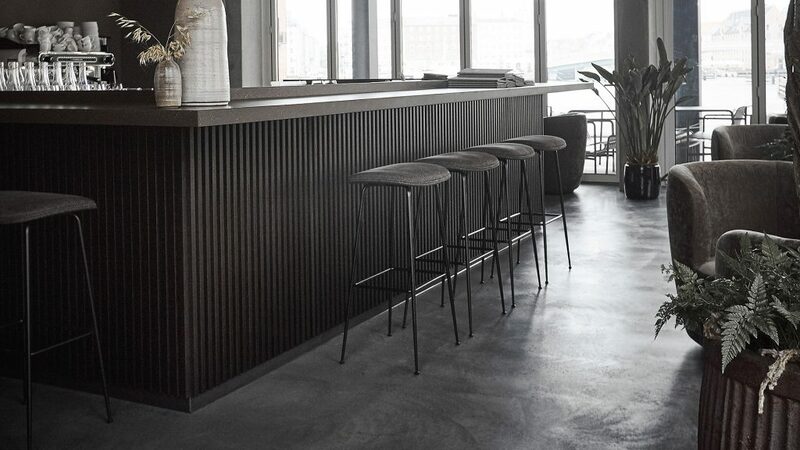 – Nuvolato Architop® is a concrete flooring solution that overtakes the thickness limits of traditional concrete; with only 3-4 mm thickness, in fact, this solution allows to obtain a seamless, rough surface with a marked industrial look. Suitable for indoor or outdoor applications, Nuvolato Architop® fits any substrate, even on top of floor-heating systems. 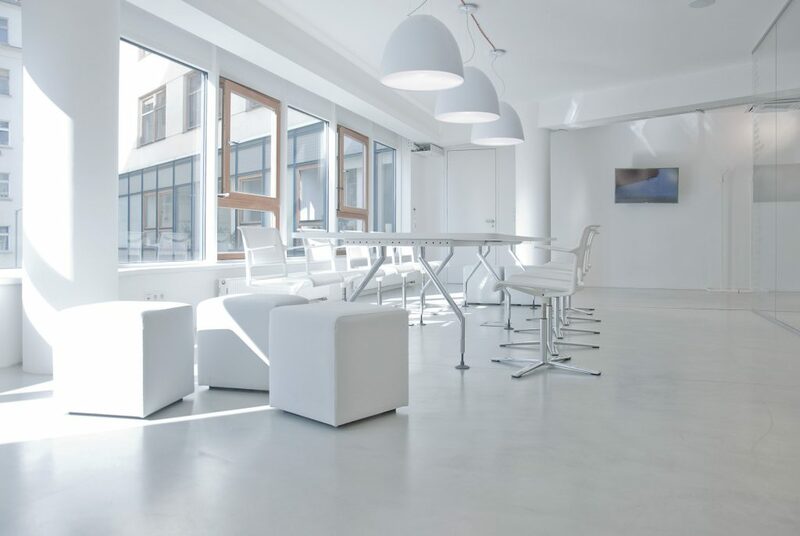 It’s therefore ideal to cover tiling floors and to give an industrial look to the house, but it can also match public places such as commercial areas or exhibitions thanks to its great traffic-resistance. With a wide range of 29 standard colours, Nuvolato Architop® is greatly customizable also in the finishing: it comes either in a cloud-effect texture, or in an acid-stained effect, to give your spaces an original, exclusive charm. It has a high adherence, it’s resistant to wear, weather conditions, chemical agents, abrasion and frost. 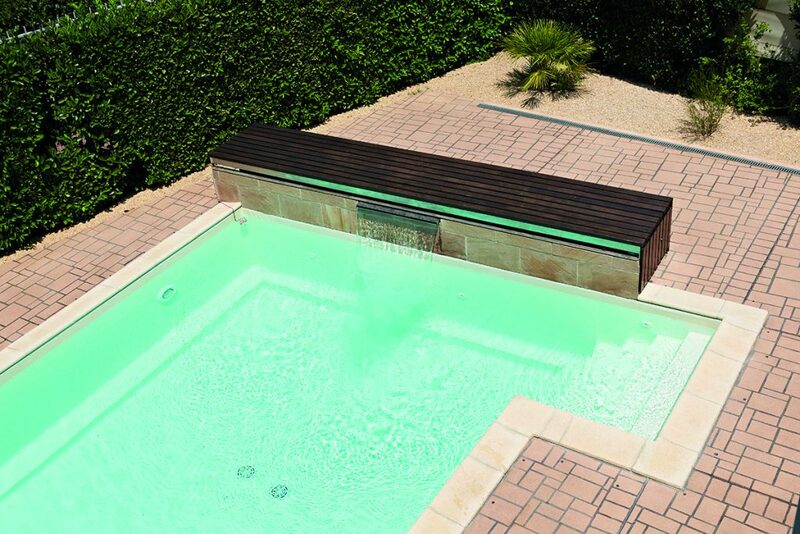 – Sassoitalia® is an outdoor solution that evokes the Italian tradition of “washed pebbles”. 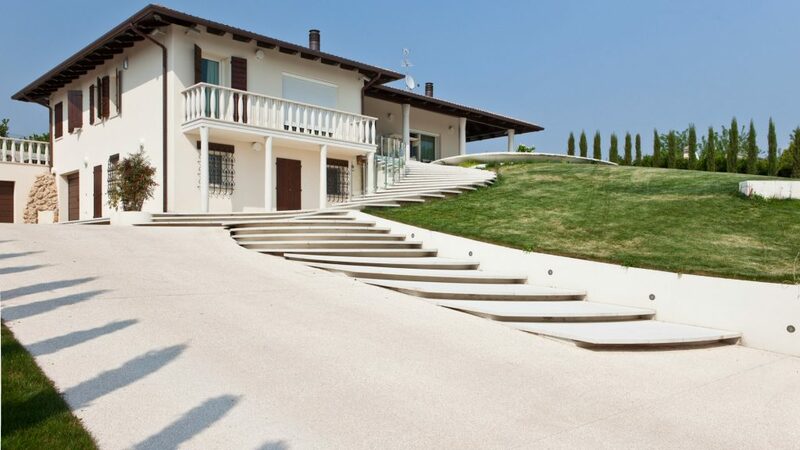 With its great scenic effect, Sassoitalia® is greatly customizable with several types of aggregates, various colour combinations and it perfectly matches other kinds of materials such as marble, bricks or natural stone. Thanks to its quick installation, in just a few days it’s possible to walk on the new floor with a considerable reduction of the construction site’s costs and time. Its particular structure makes Sassoitalia® resistant and long-lasting: if treated with specific protective resins, it can become anti-absorption, dust- and weather conditions-resistant. For an intact beauty over time. – Lixio® is a decorative concrete surface that recreates the ancient beauty of Venetian floors with marble aggregates and smoothed stones. With only 5 mm thickness, Lixio® allows to create an original seamless floor with exclusive high-quality Italian marble aggregates; it’s therefore ideal in case of renovation or to cover an old tiling floor because it allows you to cover the old existing surface without demolitions. Lixio® is available in several textures, created with a special mix of high-quality Italian marble aggregates: from the virginal Carara White to the seductive Ebony Black 100, through the romantic Terracotta Red. Various finishings are also available: shiny, satin, slip-resistant or even bushhammered. – Stenciltop is a decorative concrete surface designed to renovate and embellish the existing floor without removing it. Some simple paper stencils are used to decorate the surface; it’s easy and quick to install and is therefore convenient to guarantee a shorter and less expensive construction site. With just a few millimeters of thickness it’s possible to renovate sidewalks, pedestrian areas, pooldecks, driveways and access ramps. This solution is suited to coat different types of surface and therefore to uniform the existing floors. Thanks to its great adherence to any support, after an adequate preparation it can be applied to most materials. WHY COVERING THE TILES AND NOT CHANGING THEM? Changing the old tiles can be an expensive and long process. Unless an electric or plumbing intervention is needed, it’s worth considering to cover the tiles instead of removing them; with Ideal Work’s surface coatings it’s possible to cover the old tiles without demolitions and therefore to avoid long and expensive restoration works and their disadvantages: noise, dust, dirt etc. Give your house a new look in an easy and quick way. Covering the tiles with concrete or microcement can therefore represent an excellent solution because this ductile and versatile material allows to coat almost any surface: pieces of furniture, kitchen’s countertops, sinks, tubs and shower stalls, creating some modern, evocative and visually larger spaces. There are endless possibilities of customization: from standard shades to particular colours, with a wide range of scenic textures for an ultra-contemporary environment. Unlike tiles, these surfaces are seamless and they therefore guarantee a greater hygiene because they prevent the dirt from accumulating in the joints and consequently the proliferation of moulds and bacteria. CAN ALL THE TILES BE COVERED? Yes, with Ideal Work®’s surfaces it’s possible to cover the tiling floors and walls of the bathroom and the kitchen easily and quickly. With just a few millimeters thickness the old tiles can be covered and the room acquires a new look without the inconveniences of demolition works. Specifically in the kitchen it’s possible to coat the floors, the walls and the countertop to give the room an industrial look. The bathroom can be transformed into an ultramodern space too, because Ideal Work®’s surfaces allow to cover not only the bathroom tiling floor and walls, but also the shower stall, the tub and the sinks for a great scenic effect and a visually enlarged space. With Ideal Work®’s solutions it’s possible to cover the old tiles and to obtain the look you want both indoor and outdoor: if you choose an industrial style you can cover the tiles with a concrete effect, more or less rough according to the character you want the space to have. For a warmer look, the wood, stone or brick effects are great; for a rétro look and a timeless elegance marble aggregates are perfect instead. Every effect is customizable with a wide range of colours, from the more standard white, black and terracotta, to the more particular pale blue, yellow and seawater.